Senator Harcourt Husbands is the Parliamentary Secretary in the Ministry of Education, Science, Technology and Innovation. He is a trained teacher and taught Social Studies at Wesley Hall Junior for many years. He is a former President and General Secretary of the Barbados Union of Teachers and the President of the Caribbean Union of Teachers. He has worked for the Communications Workers of America in Trenton, New Jersey, USA. Senator Husbands has also been the Executive Director of the Barbados Employers’ Confederation and a Vice President of the Caribbean Employers’ Confederation. 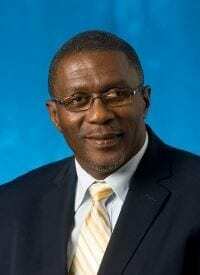 He has served on several local boards and committees, including the National Insurance Scheme, the Barbados Accreditation Council, the HIV and AIDS Commission, and as Chairman of the Board of the Samuel Jackman Prescod Polytechnic. He holds a University of the West Indies’ Teachers Certificate; a BSc in Public Administration (UWI); and a Masters in Labour and Industrial Relations from Rutgers State University of New Jersey. He is married to Maxine, who is the Principal of Selah Primary.